Spyware protection :: Quickly scan your computer for Spyware, Trojans, Backdoors, and Adware. Quickly scan your computer for Spyware, Trojans, Backdoors, and Adware. Now more than ever, your computer is constantly being exposed to new and evolving threats. These threats range from annoying pop-ups to the truly harmful trojans, backdoors, and other malware; threats that can destroy your data and leave you computer vulnerable to future attacks. 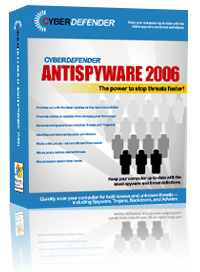 CyberDefender AntiSpyware 2006 is a comprehensive real-time solution that protects you from both known and unknown threats. Regain control of your computer and your Internet experience. CyberDefender Threat Central analyzes threats and calculates the risk levels of suspicious files and processes. This expert system tests and ranks the threat on a Universal Severity Scale™, and updates the CyberDefender threat database automatically. Human intervention is required only for technical assurance, ensuring you the most updated and accurate threat protection available. This threat assessment process is significantly faster than traditional methods. It's time to fight back. Anti-Spyware 2006 gives you the opportunity to put your computer to work in the war on threats. CyberDefender AntiSpyware 2006 identifies and resolves threats in real time, while previously classified threats are combated immediately. Reports of new unclassified threats go instantly to Threat Central where the threat is assessed and analyzed and then the update is broadcast to CyberDefender AntiSpyware 2006 users. Every PC equipped with CyberDefender AntiSpyware 2006 is part of a collaborative network that ensures rapid and intelligent responses that not only defeat spyware, but also viruses and Internet scams. Once you are part of the CyberDefender Network, your PC will be protected from the latest threats. Provides you with the latest updates as they become available. Prevents malicious websites from changing your home page. Removes and quarantines unwanted Threats and Programs. Identifies and removes Spyware and Adware. Works while you do - with an efficient Scan speed. Allows you to restore deleted threats. Stop snoopers dead in their tracks. It's time to fight back. Anti-Spyware 2006 gives you the opportunity to put your computer to work in the war on Threats. Try it now. Regain control of your computer and your Internet experience. Two words: Threat Central. As a Cyberdefender user, your computer is tied to a database of threats created by all other users in the network. It makes identifying new threats fast and powerful. Processing services are provided by RegNow, a leader in e-commerce processing. © 2007 Ncode Software LLC. All Rights Reserved.